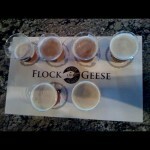 Goose Island has been on a roll this year. After encountering some challenges with growth in 2009, the brewery decided to diversity its lineup and to make some serious (and somewhat shocking) changes due to the industry shift towards bigger beers and Belgian styles. The most newsworthy and difficult decisions were the discontinuation of Goose standards Nut Brown and Oatmeal Stout, announced in April. These two beers had been a cornerstone of the company’s offerings for 20 years, but their removal freed up 40% of the brewer’s capacity. The other notable announcement came in August when the news was leaked that Christmas ale won’t be released this year. The inside source cited more challenges with capacity, including meeting rising demand for Barack Obama’s favorite beer – their flagship 312 Urban Wheat Ale. This was an exclusive beer for this event that has never been seen in Ohio before. As far as I know, it’s never been outside of the brewery, and there are no reviews on the Internet. So, consider this a Bobby Likes Beer exclusive! This beer is a dark brown color with much cloudiness, providing some depth of color and very little “muddiness”. The head retention isn’t up to snuff, even compared to other Goose wheat beers, which don’t really compare to German wheat beers. But it looks nice nonetheless with a great chestnut and mahogany color and overall attractive appearance. The beer smells big-time of torrified wheat, chocolate, caramel, and a touch of smoke. The bouquet is really quite interesting and expressive. The wheat isn’t an afterthought either; the signature scents of wheat are really well integrated. So far, so good! The taste of American Dark Wheat Ale is composed of a nice roast and toast plus some wheat as well. Some slight malt smoke (like in a scotch ale, not in a rauchbier) and caramel sweetness work very well. This unique combination is not only interesting, it really makes sense to me the way everything comes together. I notice just a touch of light tartness as well from the wheat. I’ve never had a beer with this sort of a flavor profile. It is very good indeed. The mouthfeel is creamy and smooth, with lower carbonation working well with the wheat. The aftertaste is sweet with a slight kiss of wheat tartness. I found this to be a truly unique beer, very different from any other American Dark Wheat or Dunkelweizen I’ve ever had. Does Bobby Like Goose Island American Dark Wheat Ale? Another exclusive for the Goose Island tap takeover, making its Ohio debut in Rocky River and only spotted before in the Goose Island pubs in Chicago. The elusive and exclusive beer is cloudy with a two finger head that eventually recedes to a thin film. Some great lace and a wonderful golden complexion with lemon and sunshine colored edges make me think that this is a wonderful shade for a beer. It could be a touch more cloudy, though as I prefer the look of traditional saisons to their clearer American counterparts. The smell is invigorating as the lemongrass really shines through! A huge, crisp citrus aroma with some nice thyme makes an appearance. The beer is both herbal and inviting. Some spicy pepper steps out of the shadows as well and really makes the lemon pop. The taste is also very lemony with some good tartness and a hint of pepper. A slightly tart aftertaste is experienced with great lingering lemon. That’s what this beer should be called – Great Lingering Lemon! The mouthfeel is lighter than medium, but heavier than light with good carbonation and a tart aftertaste. It could be a touch more weighty in terms of the body and a touch more cohesiveness in aftertaste, it drops off pretty heavily. The finish is dry and has some more lingering citrus. Here’s the deal – if Indira was available, I would drink it all the time. This beer is wonderful, truly a wonderful summer saison in true Goose Island style. Does Bobby Like Goose Island Indira? Minx has made some appearances around town in the past month or so, so I’ve now been fortunate enough to enjoy it twice. This is a nice looking beer that is just a bit more amber and red than what I envision a perfect Belgian IPA to be. However, it’s acceptable and has a nice white head. Somewhat clear as well, this is an oddball in this mash-up of a style. It’s appealing, though. Smell is much more in line with the style. Belgian yeast with some cotton candy and chalk scents works well with citrus hoppiness (orange, peach and tangerine). Minx also has a touch of noticeable caramel malt lurking underneath. This beer has a great overall taste, very bold and American. The hops come through as the dominating flavor. In particular, I get impressions of citrus – orange, peach, grapefruit – and some pine. The yeast is slightly chalky and gives a nice compliment to the hops. Rounding out a wonderful taste, the malt is sweet and the finish is medium in terms of bitterness. The mouthfeel is nice as well – this beer has a medium body and active, pleasant carbonation. The finish is sweet/not sticky and bitter, much like an IPA or DIPA. This was a great beer from Goose Island and I’m happy to have gotten a shot to try another of these nice tap-only treats. Does Bobby Like Goose Island Minx? 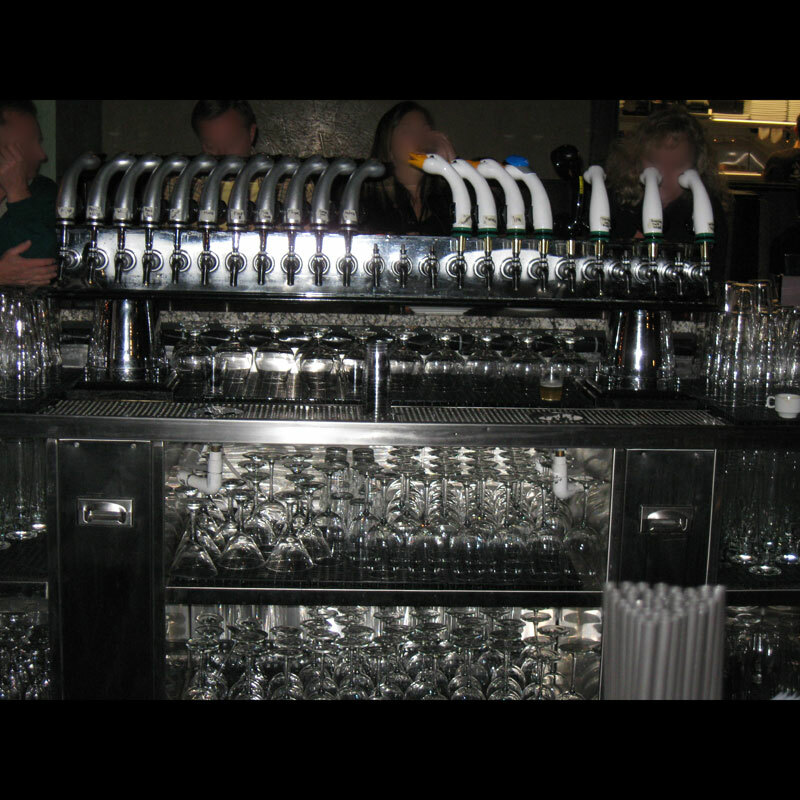 The Winking Lizard offered this gem as a special Friday keg tapping in April, 2010. My glass holds a dark brown liquid with some red edges. I can see through the bottom of the glass when I look from the side, aside from that, no light escapes it. But it almost looks like it could be filtered, especially when a typical saison is so cloudy. A small eggshell head hangs on for a long time, but the lace isn’t great. Pepe Nero has a smell that is awesome and complex. Belgian yeast, rye, clove, banana, and pepper are all mixed into a nice bouquet. This is deeply expressive and unique, with the rye and pepper really mixing things up and dancing around the more traditional yeasty esters. The taste is also very nice, complex, and unique. The Belgian yeast gives impressions of Earthiness and some citrus, particularly orange and lemon rind. The rye steps in and spices things up, and the black pepper makes it groovy with just a kick. The beer is sweet but dry, showcasing a bit of chocolate and candied sugars. Clove and cocoa powder linger. This is deep and complex but accessible. The mouthfeel is ok, but the beer is a touch watery in the finish. The carbonation is spot-on. The body could be thicker, I wonder if this was indeed filtered. Overall, Pepe Nero is a nice beer, not something worth trading an arm and a leg for, but fans of unique American takes on Belgian farmhouse beers would love this. Me? I like it, but I’ll stick to the incomparable Sophie. 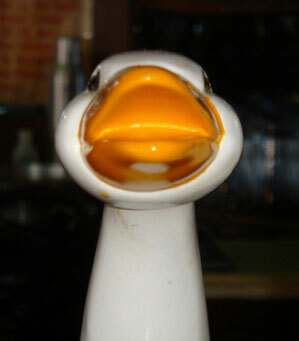 Does Bobby Like Goose Island Pepe Nero? As far as I can tell, this beer has only been served in Chicago at the Goose Island pubs. Chalk up another in the exclusive column. The beer is an orange and caramel color with amazing head. Let’s call it tea-bagged orange with active carbonation. If it were unfiltered it would be a perfect look. The beer smells of prominent citrus, tea, and Belgian yeasty esters. It is pretty expressive. Sai-Shan-Tea could use more yeast, but the orange and lemon combine with herbs and some light tea leaf (the beer uses the Rare Tea Cellar’s ‘Emperors Lemon Meritage Tea’). This beer tastes interesting, original and all-around good. Some lemon and bright Soriachi and Citra hops, plus some lemongrass and orange peel make up the citrus portion of our evening. Traditional farmhouse yeasty esters linger without being wild or dirty. Tea leaf, coriander, clove, and a touch of banana make this more than I ever expected. Delicious taste, but how does it feel? Well, the mouthfeel is a touch thin but acceptable and not watery. Good carbonation makes the beer relatively creamy and not prickly at all. The finish is nice with lingering yeast and a touch of tartness. This was another winner from Goose, building on the Saison/Farmhouse offerings in their portfolio in fine form. I’d love to get a shot at this again; this beer was one of the best of the night! Does Bobby Like Goose Island Sai-Shan-Tea? I may have been the first person ever to try this beer, as it has no record on any of the beer rating/reviewing websites! The sheet at Market described S.O.B. as “A traditional English Style Bitter, amber hued with great malty tones from the Maris Otter malt with a touch of first gold and fugal hops. 4.3% ABV”. That was a pretty good description, but let’s take a closer look. The appearance was the best part of this beer. It is clear, not cloudy with a great copper color and some amber and brown notes. SOB has a nice, white head and great lace. This is an outstanding looking beer. The smell is primarily composed of mild caramel and some noble hops. The beer is not very expressive but pleasant nonetheless. I know a mild should be, well, mild but I was expecting a bit more malty depth. The taste gets a little bit better. There is a light brown-ale-like toast, with some caramel and a kiss of sweetness. But then there is a very big flavor drop-off. The aftertaste is watery and poorly integrated, but it is a very light beer. This could use more hops too, very, very mild floral hops just are not too flavorful overall. Maris Otter, used as a “specialty” malt, doesn’t come through enough. In terms of mouthfeel, the beer has nice carbonation but a watery body. It is super-drinkable, a very drinkable session ale but in a way it reminds me of more things I don’t like about session ales than things I do. While I’m happy to have tried this, it wasn’t something I think I’d revisit, especially if there are better Belgian offerings from Goose Island available. Does Bobby Like Goose Island Standard Ordinary Bitter? 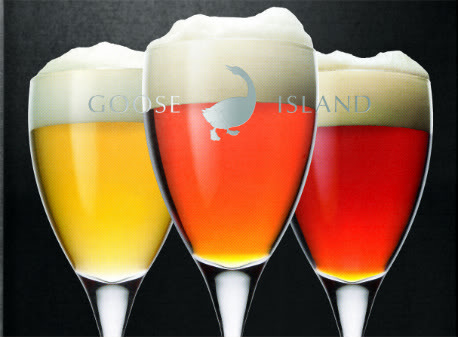 Tripel has been on-and-off at the Chicago Goose Island pubs for a few years, but has only been served outside of the brewery at very, very special events. Events like this one! 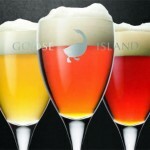 Goose Island Tripel is straw gold in color with little head and a clear complexion. It’s a nice looking beer with very fitting look for an American take on the Belgian standard. The beer smells of some light pepper, candy malt sweetness, and some clove and coriander. This is a wonderfully polished smell – not rough at all – but very cohesive and the booze is extremely well hidden by the sweetness. Some orange and citrus round out a good experience for my nose by adding some welcomed hoppiness. I’ve just had a few Tripels with more going on. This big beer has a ton of great spice, sweet Belgian candy malt and a wonderful touch of coriander and clove. Really flavorful and expressive, the beer finishes sweet with medium to mild bitterness. A touch of orange peel and lemon in the finish seal the deal – this is a fantastic tasting beer. The beer has lower carbonation but nice body. It is crisp and refreshing and has a great finish with just a touch of stickiness that vanishes once the yeast dries things out. This is very drinkable and enjoyable offering from Goose, and I’m sure any lover of traditional and American Tripels will love it! 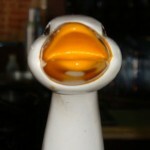 Does Bobby Like Goose Island Tripel? When Winking Lizard first put this gem on tap in August, I seriously considered renting an apartment across the street. This is one great looking brew, golden orange in color with straw-yellow edges. There’s a small 1/4 finger white head that sticks around well, but does not leave good lacing (probably the beer’s only fault). It has very active carbonation, with bubbles rising from the bottom of the glass in a steady stream. This is one great looking beer; it almost seems to be capturing the autumn sunlight. I wish I could put a few away for those Cleveland January days! The smell is much more citrus based that I would have thought. Orange peel and coriander provide a wonderful brightness. There’s also some white pepper and rosemary, but they’re taking a back seat and just adding depth. The star of the show is the wonderful orange and lemon notes, reminding me of orange juice, and culminating in a slight tartness. Brilliant and just shy of perfection due to the lack of noticeable yeast character. This is citrus heaven. Sweet Belgian candy dances with oranges and lemons. The coriander makes it taste familiar and genre-appropriate. Some wheat malts as well. A touch of fennel, rosemary, and white pepper add spicy depth but never distract. The mouthfeel is medium-bodied, certainly showing more weight than a normal wit. Nice carbonation makes things move along, and the dry and tart finish leaves the beer feeling light and refreshing. White City exceeded my expectations and I would love to have the chance to try this again sometime. I bet this glass of liquid sunshine would be great any time of year. Does Bobby Like Goose Island White City? Willow Street Wit is the last beer that made its debut appearance outside the brewery for this event. Willow street wheat is a yellow orange color with some nice head and lace. It is cloudy and really nice looking overall, very typical and inviting for a Belgian Wit. I put my nose in the glass and get a ton of green coriander, some nice orange peel, and some nice Belgian yeasty esters. A touch of lemon rounds things out and then a dry, chalky yeast scent takes over. Some grassy hops also make their presence known. Traditional and flavorful, the beer starts out scoring very high marks for appearance and smell. The taste is primarily composed of some great wheat malt, orange peel, and a bright lemony citrus flavor with some nice, fresh coriander. I enjoyed the really, really nice taste but I noticed just one thing I would change. The beer is a touch too chalky and dry, with a Sahara Desert of a finish. I think it’s always a tug-of-war with wheat beers. A brewer wants to get the full smell and taste of the yeast but needs to be careful to avoid having the beer end up so dry. Orange liquor and honey also have some presence in the whole taste, adding a touch of complexity to an otherwise to-the-style beer. The mouthfeel is composed of a creamy carbonation and medium body. A really nice vibe is going on here, but the chalk is a touch too much. Still, this is an awesome, refreshing, great summertime beer! I hope it makes the rounds next year. Does Bobby Like Goose Island Willow Street Wit? Thanks to the very kind folks at Market and Eddie Anderson of Goose Island for a great event! 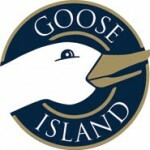 This was well produced and well attended, and the variety in amazing styles of beer stood as a testament to the successful shift in direction Goose Island has made this year. 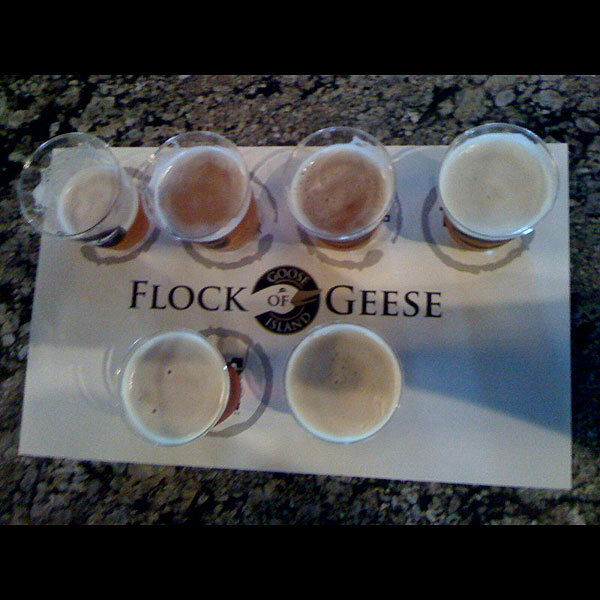 As you can tell from my scores, the beer Goose Island makes can hang on the same stage as any other brewery in America and Ohio is a lucky state to have so many great Goose products on our shelves each and every day. 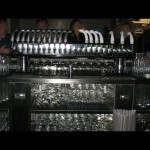 We’re even luckier to see many exclusive draft-only beers show up throughout the year at better beer bars. Now, if we could just get our ABV cap and get Bourbon County stout and its variants… well, I don’t want to press my luck. One thing is for sure; everyone who came out to Market for this great Cleveland Beer Week event hit the jackpot!